We got this nappy rash cream as a free sample and it has been handy to have in the house. Not sure if I would pay full price for it but if it were on special I would consider buying it. I really like this cream. It’s a nice thick zinc and stays put without rubbing off straight away. It’s effective at clearing up nappy rash. This cream has a higher zinc percentage then some of the more expensive brands and is my favourite cream for this reason. Big tube for a reasonable price. Great Product for minor Rash! This product was great at healing my daughters minor nappy rash but if the rash becomes larger or starts to get severe this cream didn’t help to heal that. However this is still a product I keep in our baby care cupboard for minor healing. This was good on a mild nappy rash/as preventative, but when we had a bad rash we had to pull out the big guns and get something thicker. I got a couple of these in the house, i believe it works to best of its abilities , ive had a nappy rash that just got worse and this product never seems to relieve it on this occasion. My daughter screamed when I applied this. It was fine on good skin that had no rash or redness but as soon as she had a nappy rash it stung so much I had to very quickly bath her again to get it off. Would never recommend this. We tried some other creams on the market and they irritated baby’s skin. During the odd occasion when my little one gets nappy rash. After applying Curash Nappy Cream to the treated area, it quickly calms and soothes the effected skin. It worked for us. I purchased this a few years ago, Its very thick, but easy to apply. I found it didn’t help with my sons nappy rash it made it worse. Unlike other nappy rash creams that rub off straight away when the nappy is applied, this cream is thicker and I find it stays on the affected area until the next nappy change. When Ive used this cream on my 3 babies its always healed there nappy rash swiftly. Highly recommend! 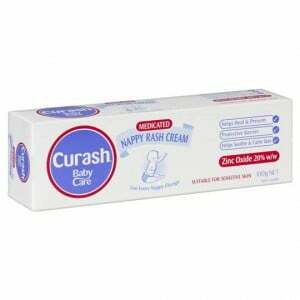 Curash is my favourite nappy rash cream! We tried some other creams on the market (Bepanthen, Sudocrem) and they irritated baby’s skin. Curash has been fine on my son, so i highly recommend it for sensitive skin! How would you rate Curash Nappy Cream?